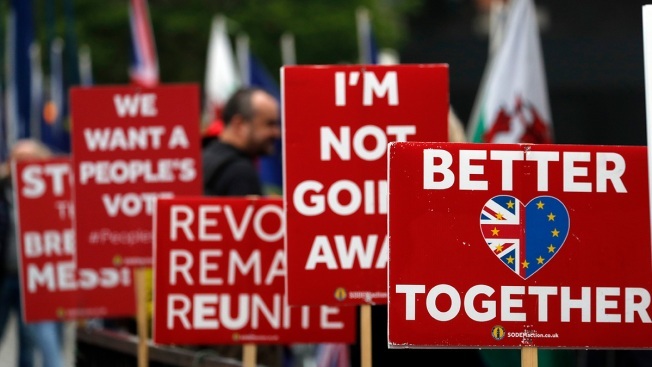 Pro EU protestor banners are fixed on a fence opposite the Houses of Parliament in London, Monday, April 8, 2019. Britain's government and opposition party are hoping to find a compromise Brexit deal ahead of further talks with European Union leaders. 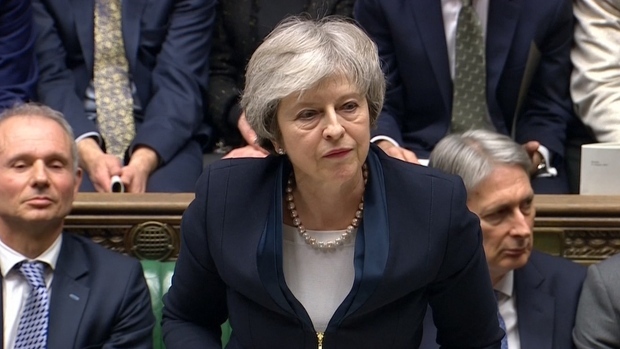 Prime Minister Theresa May wooed domestic political opponents and European leaders Monday as she sought to break Britain's Brexit impasse and secure a delay to the country's departure from the European Union. May's Conservative government and the main opposition Labour Party were clinging to hope of finding a compromise Brexit deal, two days before EU leaders decide whether to grant an extension to the U.K.'s departure from the bloc. If they refuse, Britain faces a sudden and chaotic departure on Friday, the Brexit deadline previously set by the EU. May has asked for a new delay until June 30, to give Britain's divided politicians time to agree, approve and implement a withdrawal agreement. The bloc's leaders are due to meet Wednesday in Brussels to consider the request. An extension requires unanimous approval from all 27 EU national leaders, some of whom are fed up with Brexit uncertainty and reluctant to prolong it further. French President Emmanuel Macron has been particularly resistant to the idea of further delaying Brexit, saying the EU can't be held "hostage" to Britain's political crisis. May's office said the prime minister spoke to multiple European leaders by phone Monday and will dash Tuesday to Berlin and Paris for face-to-face talks with German Chancellor Angela Merkel and Macron. British Foreign Secretary Jeremy Hunt urged European leaders to be cooperative, saying May "is totally and utterly determined to deliver Brexit." "They want Brexit to be resolved as quickly as possible," Hunt said of the other 27 EU leaders. "So do we." Irish Prime Minister Leo Varadkar said he was "open to extending the deadline." "There will be different views, but I am confident that we will reach agreement," he said after meeting chief EU Brexit negotiator Michel Barnier in Dublin. Dutch Prime Minister Mark Rutte, however, said May would have to convince EU leaders that Britain would continue "sincere cooperation" with the bloc if granted a delay. Some pro-Brexit British politicians have suggested the U.K. could try to disrupt EU policymaking if it remains a member much longer. Almost three years after Britons voted by 52% to 48% to leave the EU, the country remains divided and the political process deadlocked. Labour favors a softer Brexit than the government has proposed and seeks a close economic relationship with the bloc through a customs union — a trading area that sets common tariffs on imports while allowing free trade in goods moving between member states. "The government doesn't seem to be moving off its original red lines," Labour leader Jeremy Corbyn said. "We are looking for movement." The EU would welcome a move by Britain to keep close post-Brexit economic ties. Barnier said Monday that the bloc was willing to be "much more ambitious in our future relationship" and would agree to a customs union arrangement. It would also be tough for Ireland, the only EU member state to share a land border with the U.K. Any customs checks or other obstacles along the currently invisible frontier would hammer the Irish economy, and could undermine Northern Ireland's peace process. Barnier said the EU would remain "fully behind Ireland." "If the U.K. were to leave the EU without a deal, we would not discuss anything with the U.K. until there is an agreement for Ireland and Northern Ireland," he said. It was unclear whether the cross-party talks in London would succeed. May's reach for compromise left her caught between angry Conservatives who accused her of throwing away Brexit, and Labour opponents mistrustful of her sudden change of heart. Former Foreign Secretary Boris Johnson, a leading Brexiteer, said a customs union would "enslave" the U.K. He tweeted that it "cannot, must not and will not happen." 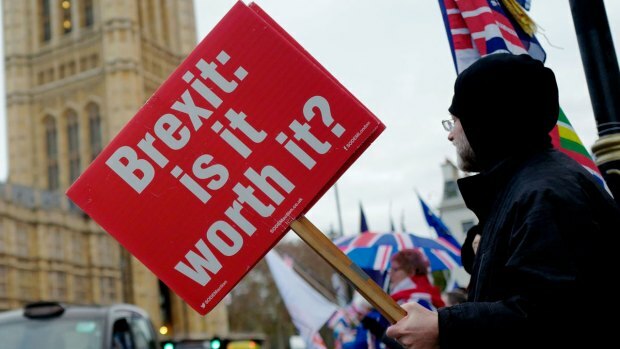 Late Monday, Parliament passed a fast-tracked law that compels the government to seek a delay to Brexit rather than leave without a deal. May has already committed to doing that, but many lawmakers don't trust the government and passed the bill as an insurance policy. The government announced Monday it had taken the legal step required to start preparations and set a May 23 date for the poll. It said the measure "does not make these elections inevitable as leaving the EU before the date of election automatically removes our obligation to take part." "There's some urgency to it, but I do think it's important for everyone to take their responsibilities seriously, whatever party they come from, and try and get to a point where we leave the EU, as people have said they wish to do, and to do it on the best possible terms," he told the BBC. "I think that's achievable." Associated Press writer Danica Kirka contributed.